The concrete around your business is often the first thing customers look at when patronizing your business, and the last thing to leave an impression as they leave. So why not give them the best first and last impression possible. We would love to help with this. When it comes to gas stations, concrete is only one of the surfaces we clean, and only one of the surfaces that customers notice when visiting. The windows, and awning are also areas that need to be cleaned. Windows are pretty self explanatory. Lastly we take a microfiber towel and buff out areas and clean the frames. Being aware of the waste water run off to be compliant of the clean water act. Using traffic cones and caution tape in order to close off sections to public. Concrete cleaning is one of our very best specialties, there are many stains that can not come out with just cold water and pressure. 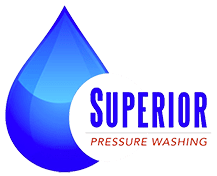 We use HOT water pressure washers dialed into the right pressure to remove gum, oil stains, food and drink stains, and obviously all dirt and foot traffic stains without damaging the concrete. We use surface cleaners to properly clean the concrete, by using surface cleaners we eliminate the dreaded striping that occurs when just using a wand. A common misconception is that only extremely high pressure will clean sidewalks and concrete aprons. This is not true, using the right solutions play a big part in cleaning concrete too. Superior Pressure Washing uses the very best chemicals as needed to clean stains from your concrete. Gum removal is the next topic that I would like to touch on. Gum removal doesn’t need much pressure at all, but extremely hot water, we heat our water to a little over 200 degrees and use a scraping scraping motion with the pressure washing gun to safely “POP” the Gum without damaging the concrete. The days of having employees on their hands and knees scraping gum is over.